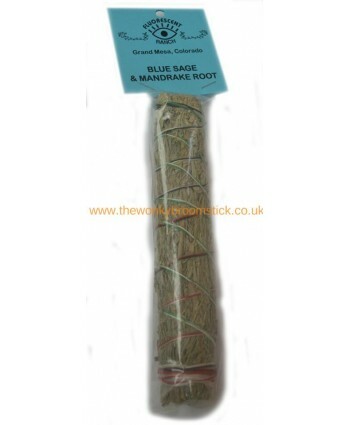 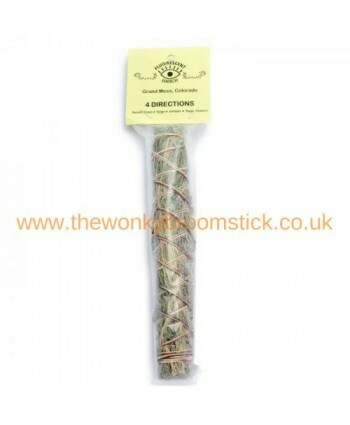 4 Directions by Fluorescent Ranch 7.5 " quality smudge stick one suppliedContains: Blue Sage, Sweet Grass, Sage Flowers and JuniperSize: Approximately 7.5 inches in length (19 cms)Origin: Grand Mesa, Colorado Smudge Sticks: Can be used to cleanse negative energies for a person, place or space.Blue sage or Grandmother sage - Cleansing of negativity or ExorcismSweet Grass - ..
Blue Sage and Dragons Blood Sage Stick by Fluorescent Ranch 7.5 " quality smudge stick one suppliedSize: Approximately 7.5 inches in length (19 cms)Origin: Grand Mesa, Colorado Smudge sticks: Can be used to cleanse negative energies for a person, place or space.Blue sage or Grandmother sage - Cleansing of negativity or ExorcismDragons blood used for protection and purifica..
Blue Sage and Mandrake Sage Stick by Fluorescent Ranch 7.5 " quality smudge stick one suppliedSize: Approximately 7.5 inches in length (19 cms)Origin: Grand Mesa, Colorado Smudge sticks: Can be used to cleanse negative energies for a person, place or space.Blue sage or Grandmother sage - Cleansing of negativity or Exorcism.Mandrake intensifies magick in any situation. 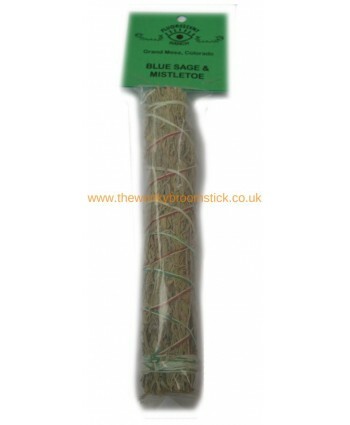 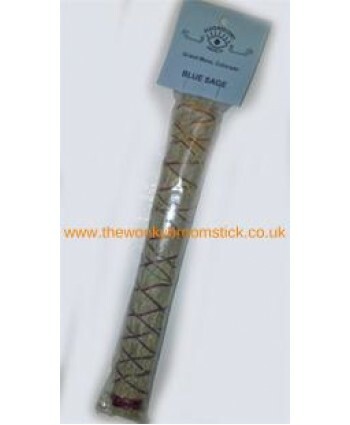 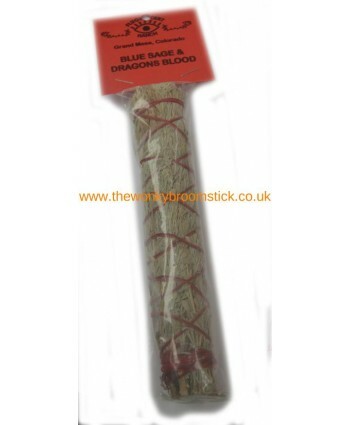 It i..
Blue Sage and Mistletoe Sage Stick by Fluorescent Ranch 7.5 " quality smudge stick one suppliedSize: Approximately 7.5 inches in length (19 cms)Origin: Grand Mesa, Colorado Smudge sticks: Can be used to cleanse negative energies for a person, place or space.Blue sage or Grandmother sage - Cleansing of negativity or ExorcismMistletoe used to attract love, for protection, fo..
Blue Sage Stick by Fluorescent Ranch 10 " quality smudge stick one suppliedContains: Blue Sage (Grandmother Sage)Size: Approximately 10 inches in length (25 cms)Origin: Grand Mesa, Colorado Smudge sticks: Can be used to cleanse negative energies for a person, place or space.Blue sage or Grandmother sage - Cleansing of negativity or Exorcism..
Large California White Sage Smudge StickSize: Approximately 9 inches in length (24 cms)Origin: Grand Mesa, Colorado Smudge Sticks: Can be used to cleanse negative energies for a person, place or space.White sage (Salvia apiana) is a plant native to high desert ecosystems and grows prevalently in California and in the Mountain West. 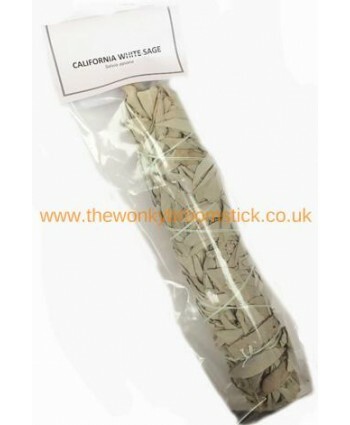 For hundreds of years, white sage has bee..